Spring practice is underway, having stated March 10th. Over the next few weeks, we’ll be previewing each position group and adding any notes we hear about player performance along the way. OU loses some big impact receivers this year. Mark Andrews, a Unanimous All-American and Mackey Award winner in 2017, Jeff Badet, and Jordan Smallwood are among the group of departed targets. Including fullbacks and running backs who are no longer in Norman, OU loses just over 40% of its receptions, yards, and touchdowns last year. While that number was bigger going into 2017 (60% of the receiving yards left around 2016), 40% is still a large chunk of offense. With that said, this position is absolutely loaded with returning experience and young talent. 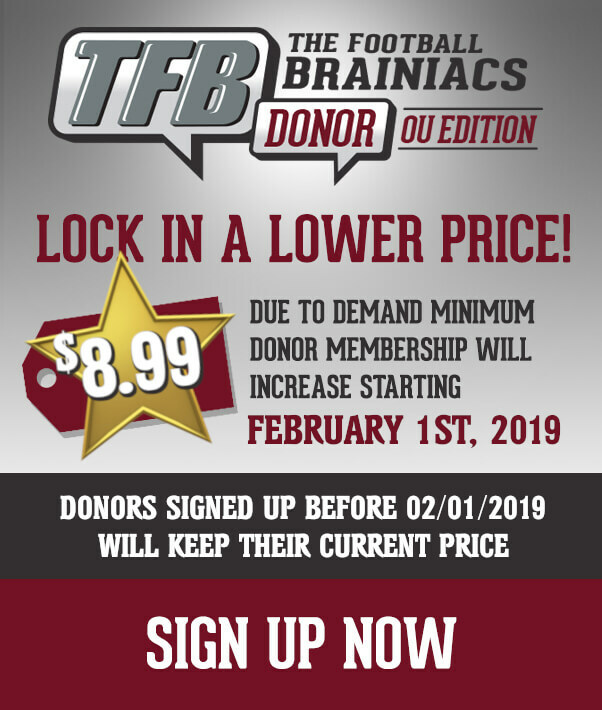 Nick Basquine, A.D. Miller, Marquise Brown, Mykel Jones, Grant Calcaterra, CeeDee Lamb, and Charleston Rambo are the returning scholarship receivers. Jaquayln Crawford, Jaylon Robinson, Kundarrius Taylor, and Brayden Willis are the incoming freshmen, with Crawford being the only early enrollee who will be available for spring ball. Basquine is quite the interesting story. He walked on to the team prior to the 2014 season and immediately redshirted in his first year with the Sooners. During that year, he was named OU’s Scout Team Offensive Player of the Year. Shortly before the 2015 football year kicked off, he suffered a hand injury that ended any chance of him seeing the field for the year. As he came back for 2016, Baker Mayfield sang his praises during practice, mentioning that he would be playing a lot. It was hard to know if that was just friendly talk or a real prediction. Then, Sooner fans got to see him in action. His first catch of his career came against ULM on a 62-yard touchdown reception. He went on to have 20 receptions for 265 yards and 2 touchdowns during the 2016 season. After an excellent performance against Iowa State, he was awarded a scholarship. Unfortunately, the 2016 season is his only one played so far. Basquine sat out the 2017 season with a torn Achilles tendon. Then, he injured the other Achilles tendon this February, which will cause him to sit out for spring camp. Fortunately, Coach Riley expects him to return for fall camp. Basquine has now had two seasons derailed due to injury, never touching the field in either one. He would most certainly fulfill the requirements of the “medical hardship waiver,” which dictates that a player must compete in less than 30% of the season’s game and must have had a season-ending injury. This waiver is not usually applied until later in an athlete’s career, so after the 2018 season Basquine would be eligible to apply for the waiver if he so chooses. However, staying healthy will be his priority. All of that to say, Basquine has worked incredibly hard to get where he is and has shown excellent potential as a receiver. As fans, it’s fun to root for someone when you can see their passion and dedication. He is both liked and trusted by both the staff and should be a frequent target in 2018. Miller saw limited action in 2015 during a year he could have redshirted. He showed some potential but did not earn much playing time. Fast forward to 2016, and he started off the season strong. He had 7 receptions for 104 yards and 2 touchdowns through the first 3 games. That pace would have made him one of the most dependable targets for the Sooners. He finished, however, with a total of 12 catches for 145 yards and 2 touchdowns, not recording a catch the last 6 games of the season. Then, in 2017, Miller struggled with a hamstring issue in fall camp that ultimately led to a redshirt season. So far, all signs point toward him having made a full recovery. Miller has the skill set to be excellent wide receiver in the OU offense but has not taken that next step. This could be the year for him to do so; TFB reported in a January Open Post that Miller ran the fastest time of the wide receivers with an electronic sub 4.4: that’s really fast. 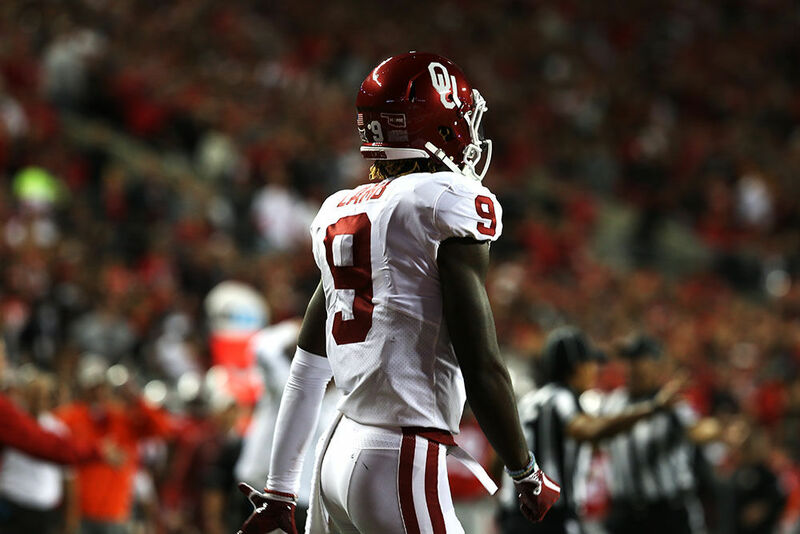 Coming into the 2017 season, many comparisons were made in size and speed between Marquise Brown and Dede Westbrook – not a bad guy to be compared to. Brown had some good games throughout the season, but it was probably the Bedlam game that really put him in the national spotlight – he cruised to a 265-yard 2 touchdown performance, averaging almost 30 yards per catch. The “Hollywood” nickname that he had already earned picked up steam quickly. Brown finds a way to get open, and once he’s in space is when the fun really begins. Brown was an integral part of the Sooners’ receiving corps in 2017 and will be a big factor again in 2018. Jones recovered from an ACL injury and was able to prepare for the 2016 season, playing in about half of the games and making some plays. He showed flashes of being special during the year but didn’t play with great frequency. In 2017, Jones played in every game, but still didn’t get a very high number of targets. 2018 could be the year for that to change; he is explosive and very slippery in the open field (for proof, see below). Jones will miss spring ball, as he recently had shoulder surgery, but should be back in plenty of time for fall camp. Mark Andrews Grant Calcaterra is a big, quick tight end/ wide receiver. He will be the main player in that position this year with the departure of Andrews and will fit in well. Calcaterra played in every game in 2017, making catches in five of them. He is very similar in size and play to Andrews and fits in well to the system. However, it’s not just his size that makes him special; Calcaterra has some excellent hands. Grant was on the receiving end of possibly the best pass and catch from Baker Mayfield in 2017. Guys like Calcaterra create nightmare matchups for defenses in the middle of the field, and Riley will look to exploit that again in 2018. Lamb will look to build on his freshman campaign in 2018 and potentially become a 1,000-yard receiver himself. First thing’s first: that’s an awesome name. Rambo committed to the Sooners in March 2016. His spotlight from McKinzie is here: TFB Spotlight: Charleston Rambo. He has a bit more speed than Lamb and is excellent at adjusting to the ball during a route. Rambo has great field awareness and uses that to make catches others couldn’t make. It would be very surprising to not see Rambo make a big impact and earn significant playing time this year. I think back to watching the highlight films of Charleston Rambo and CeeDee Lamb. Those guys had films that left me wide-eyed and excited. Guys like that really separate themselves from the “rest of the crowd,” and I truly believe Crawford is that type of player. Needless to say, Sooner fans should be thrilled to have Crawford joining the team. While there is a lot of talent already at the position, Crawford may be too talented to not find some playing time his freshman year. Oklahoma will add Jaylon Robinson, Kundarrius Taylor, and Brayden Willis to an already load position group this summer. While there is certainly potential for any of them to redshirt, there is also potential for any of them to force their way onto the field – they are all going to be very talented additions to the team. However, Sooner fans will have to wait until at least this fall to see any of them on the field. Lee Morris, Myles Tease, Chase Nevel, and Sam Iheke are some of the guys who contributed from the walk-on position in 2017. OU has a good history of converting walk-on players to scholarship players and giving them the opportunity to make an impact. Morris, a high school teammate of Kyler Murray, played in all 14 games in 2017, snagging two touchdowns. Tease played in 13 games, using his quick feet to make yards. One of the things that makes Lincoln Riley so dangerous is the uncertainty of the next guy to touch the ball; he likes to spread the field and make use of lots of guys, including the walk-on players. Ohio State? West Virginia? Those were big games, and walk-on players caught a touchdown in both. Look for the high level of play to continue in 2018. Wide receiver has an excellent mix of experienced guys and talented newcomers. Lamb will continue to be a start, Brown will continue to be the Hollywood Sooner fans deserve, Calcaterra will continue to abuse defenses across the middle… the list goes on. This is a position with a lot of talent and a lot of exceptional athletes – opposing defenses ought to be worried.